SAND BEACH – 250 m! 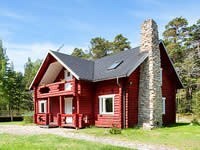 A spacious and wide holiday cottage for 8 people in a holiday village on Tahkuna Peninsula, Hiiumaa, in the direct vicinity of the island’s nicest sand beach! Pines all around; who wishes can pick blueberries, mushrooms. On the house’s ground floor there is a spacious party hall, kitchen corner, rest corner, shower room+WC. On the first floor there is a staircase hall and 3 separate sleeping rooms. A door leads directly from the staircase hall to the balcony. Parking on the parking lot of the holiday village. The cottage is located in a holiday village, where there are different possibilities to spend free time: swings for children, volleyball site, for extra charge the use of sauna and swimming pool, tenting possibilities, camping grounds.